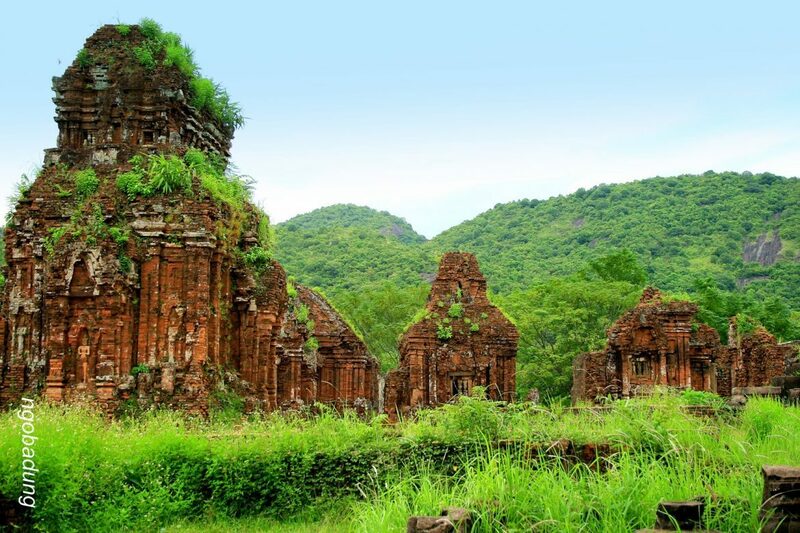 My Son Sanctuary Vietnam has been regarded as one of the most foremost, beautiful and famous temple complexes in Southeast Asia. People often compare it with other historical temples in Southeast Asia such as Bagan of Myanmar, Angkor Wat of Cambodia, Borodudur of Java in Indonesia or Ayutthaya of Thailand. It is the holy land that reflects the ancient Champa religion, culture and architectural achievement. My Son Sanctuary is a large complex including a number of religious monuments, temples, and tombs lying on a valley about 2 kilometers long and surrounded by mountains. It would be a big regret if you come to Da Nang or Hoi An in Central Vietnam and miss out visiting My Son. Now, let’s discover the beauty and heritage of UNESCO Heritage Site, My Son! 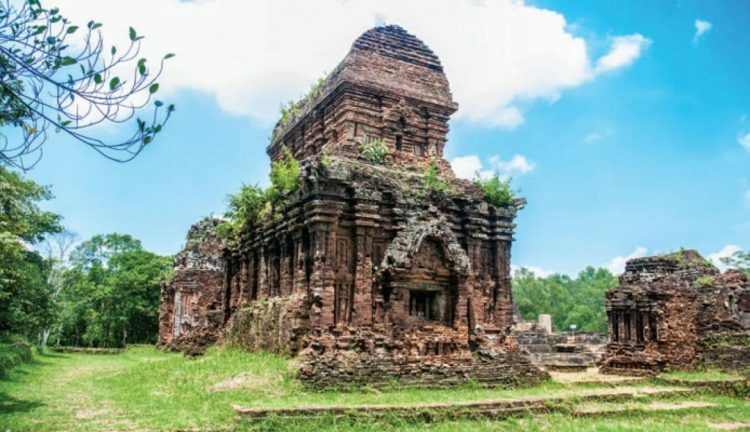 My Son Sanctuary is located near Duy Phu village, Duy Xuyen District, Quang Nam Province, in Central Vietnam, about 70 kilometers southeast of Da Nang and roughly 10 kilometers from the historic town of Tra Kieu. The temple complexes is sprawling across a valley, about 2 kilometers in width and surrounded by two mountain ranges which provide the watershed for the sacred Thu Bon river. The location gives My Son Sanctuary its strategic significance in historic past as it lies well guarded by natural wall of rocky mountains. My Son is an Indian Hindu temple complex constructed by the Champa community. The united kingdom of Champa was known as an independent country which existed continuously through many periods of time, from 192 to 1832 under different names such as Lam Ap (192-757), Hoan Vuong (757-875), Chiem Thanh (875-1471) and Panduranga – Champa (1471-1832). During the 4th to 13th centuries, this unique sanctuary owed its spiritual origins to the Hinduism of the Indian sub-continent. Under this influence, many temples were constructed to dedicate to the Hindu deities such as Krishna and Vishnu, but above all to Shiva. The earliest temples were built of wood in the 4th century, but were destroyed by a massive fire and the exact cause of which is still unknown. The next kings also rebuilt these temples in wood, then bricks no mortar and finally in limestone. The majority of structures remaining nowadays at My Son are brick. Along with the ruin of these kingdoms, My Son Sanctuary remained neglected for centuries. . 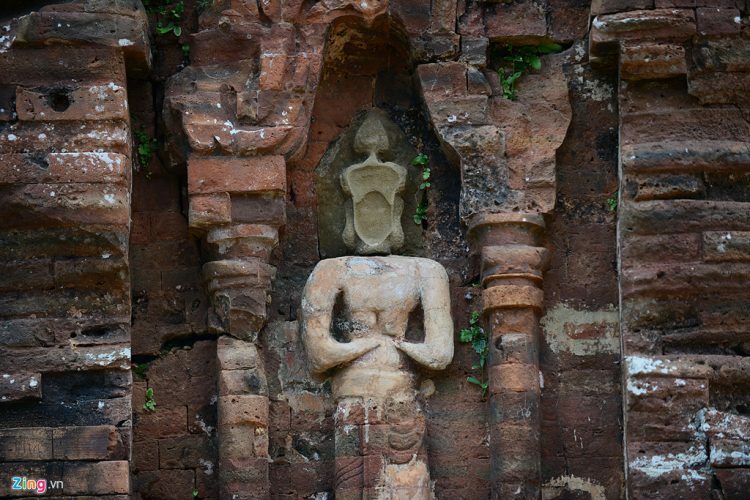 It was until the French man named M.C Paris rediscovered this complex in 1885 that discovering the history of Champa kingdom became a concern for French archaeologists. The pioneers were Louis Finot and Launet de Lajonquere, and then Henri Parmentier who made a great contribution to studying and documenting the site as it existed at that time. The document of the French scholars played a specially important role after the outbreak of the Second Indochina War. In August of 1969, US B-52 aircraft carpet-bombed extensively for a week as this region was the place where the communist Viet Cong took shelter. As a result, only 18 out of 70 structures remain. Nowadays the government has taken effort in preservation and restoration of this temple complexes. For instance, they use materials that are similar as possible as those used by the original Champa architects to replace for damaging sections. However, we can obviously distinguish from the original sections as modern bricks are cleaner and have the different color. What makes My Son Sanctuary mysterious? The answer may be due to a part of its religion that likely draw people’s curiosity when they visit here. Through observing this archeological site, you will find it not difficult to realize the longest continuous occupation for religious purposes, not only of the Cham kingdom but also within Southeast Asia as a whole. My Son is a place to construct temples, perform rituals and worship Champa reigns. It is also the place to commemorate victories and great conquests of tribes and a tool to help reigns contact gods and saints. Besides religious features reflecting thoroughly over My Son Sanctuary’s cultural values, architecture is the most striking feature of this heritage site and adds a visual treat to the eyes that no visitor can ignore. My Son is unique with its designs influenced by Indian style. Every stage of history, each temple was built to worship different dynasty, so it reflects its own architectural style with the different impressions and unique characteristics. The temple complexes at My Son Sanctuary include 3 parts: a solid tower base which expresses the word of human beings, the tower body representing the mysterious and sacred word of spirit, and the top tower representing communication manner with daily-life symbols such as flowers, leaves, animals and so on. The temple complexes are divided into 4 sectors: A, B, C, and D.
Sector A includes one main tower and 4 auxiliary towers lying on a hill in the East. It seems to be the most sacred area. Sector B includes one main tower and 3 auxiliary towers lying in the West. This sector is the smallest one and is the place where Lord Shiva is the main worshipped god. Sector C lies in the North. This is an area having a large number of towers and sculptures and divided into 2 smaller parts: C1 and C2. C1 is surrounded by a stream with 4 structures outside and 2 structures inside while C2 consists 6 structures outside and 20 inside. Most of them are religious monuments with artistic embossments reflecting the rich heritage and culture of ancient civilization. Sector D is in the North with one structure outside and 11 structures inside. 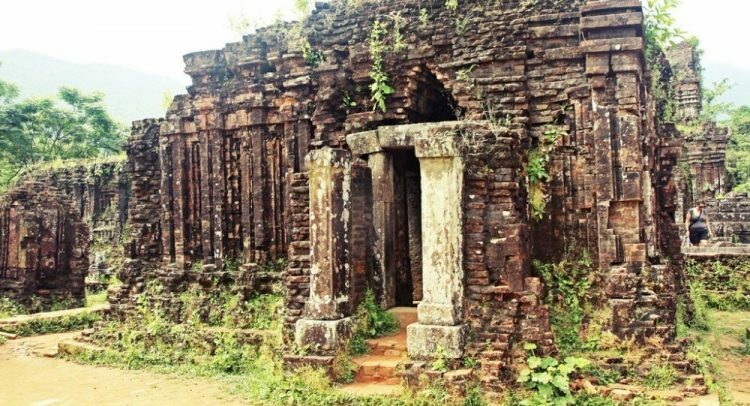 In 1999, My Son has been recognized by UNESCO as a World Heritage Site as it is a great sample of the ancient Champa civilization in the southern part of Vietnam. Taxi is likely the fastest and the most convenient transportation to travel from Da Nang to My Son Sanctuary, but this choice takes us a quite high price. In large, the average price ranges from VND 700,000 to VND 800,000 for a one-way trip. Route: Da Nang Central Bus Station – Dien Bien Phu – Le Duan – Hoang Hoa Tham – Ham Nghi – Le Dinh Ly – Nguyen Tri Phuong – Trung Nuong – Duy Tan – Nui Thanh – Cach Mang Thang Tam – Hoa Cam – National Highway 1A – Provincial Highway 610 – My Son. This way is the popular one that most young people choose when visiting My Son Sanctuary. This option is convenient because you can follow, observe or stop whenever and wherever you want. However, you need to make sure that you have a good health condition and good preparation before departing. Choice 1: From National Highway 1, you move towards the south of Nam Phuoc town (about 39 kilometers), then turn towards the West of the road 537 to Tra Kieu. From Tra Kieu, you go further 12 kilometers to T-junction, follow the signpost and move ahead 9 kilometers more to arrive at My Son from where you need to walk for 5 minutes along the rocky path leading to My Son Sanctuary. Choice 2: From Hoa Cam bridge, Highway 14B, Nguyen Trai School, you turn left to go to Kiem Lam Wharf, then pass over to direct the road 537 leading Nam Phuoc. You go more 1 kilometer to T-junction and do the same thing as Choice 1 to reach My Son. Choice 2 can save your time but the road is quite rough. With a number of temples and monuments, it can take you a half day to discover its ancient opulence. You can observe ancients sculptures, tombs as well as relics. If you are interested in history or art, this is a good chance for you to learn and discover the unique design of temple complexes, which make a prosperous civilization from the past alive in front of us. It is easier for you to follow the sectors of the sanctuary. Besides structures, you can enjoy the beauty of nature around, the cool atmosphere and quiet vibe. Besides admiring the beauty of spectacular structure, it would be a mistake if you visit My Son and miss the mysterious Siva dance here, derived from Hindu mythology. In the quiet space of the sacred valley, visitors seem to be fascinated by the Siva dance. You will enjoy how the dancers show their full flexibility, attractiveness, and mystery. Cham music is a very special element of Siva dance. It is a spiritual product crystallized from a powerful empire and culture that flourished hundreds of years ago. This religious dance praises the power of Siva destroying the dark forces such as tigers, snakes, and dwarf Muyalaca. According to Hinduism, Siva is one of the 3 most powerful gods: The god of destruction (Siva), the god of reservation (Visnu) and the god of creativity (Brahma). For the Cham people, Siva dance is an art with religious and mystical elements, which are extremely attractive to visitors. Dances are performed in the dim and foggy space beside the temple to create a great combination that charms the tourists. Hoi An is about 50 kilometers far away from My Son Sanctuary, so it is quite convenient for tourists to explore two attractions in one day. You will feel the ancient colonial elegance emitting from every corners of this town. It may be old, moss-covered roofs, streets in the decoration of lanterns, lacquered carvings or featured yellow walls, but Hoi An will take you back to Vietnam a few hundred years ago. This is just a simple part of the old town of Hoi An, but enough to make people feel nostalgic. 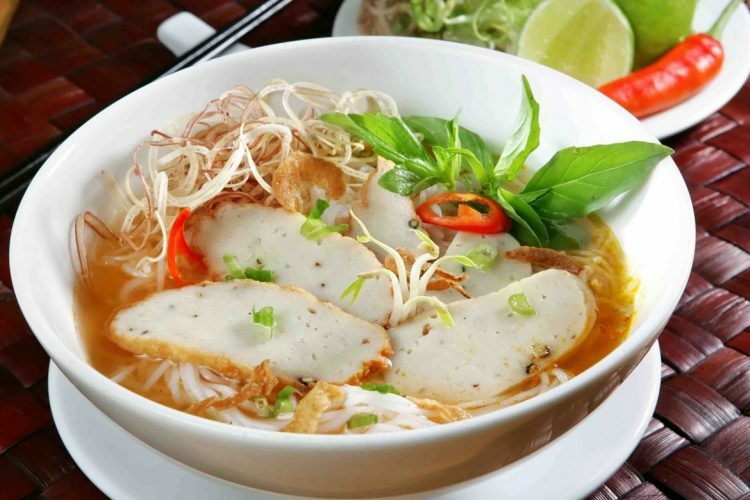 When you come to the Central of Vietnam, it is not difficult to find fish ball noodle store. However, fish ball noodle in Da Nang is considered the most special. This dish does not have the fishy smell, but aroma is slightly sweetish because of the of vegetables and sauce, which tourists can not stop enjoying. Like other dishes in Vietnam as a whole, fish ball noodles will be less delicious without fresh herbs. 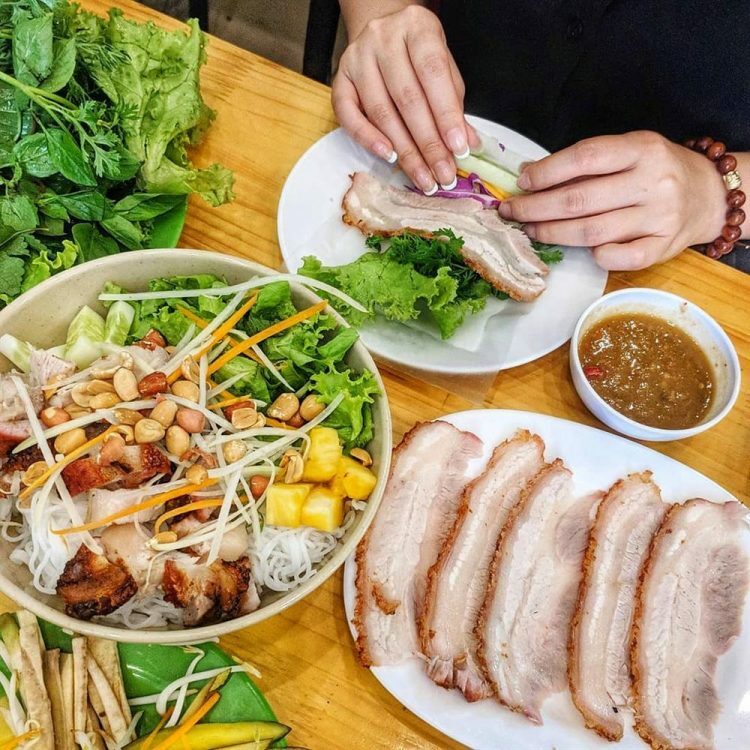 Pork girdle cake is one of the must-try dishes when tourists come to Quang Nam. This dish does not require a complicated recipe.The main ingredients include girdle cake and carefully-chosen pork. Pork is sliced thinly and then boiled just to ripen to maintain the sweet taste. This dish goes with fresh herbs such as basil, onion, banana blossom, bean sprouts, and many other green herbs. The key thing we can not miss is a fish sauce. The sauce is prepared according to the secret of each store to make a special taste attracting enjoyers. 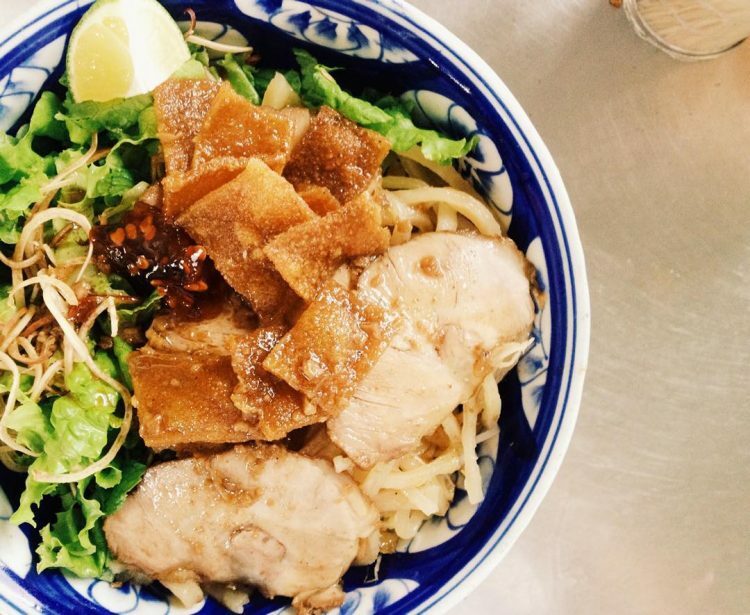 Cao Lau is the name of noodle, which is considered as a specialty in Hoi An. The outstanding feature of this dish comes from noodles elaborately processed. Firstly, to create cispy, dry and glutinous noodles, fragrant rice has to be soaked in ash water, but it must be the wood ash collected at Cu Lao, the island 16 kilometers away from Hoi An. Then, rice will be filtered carefully and ground into powder. The rice grinders must use water coming from Cham people’s well, which was made thousands of years ago. Next, continue to use the cloth to press the grinded rice several times until they are dry. Then roll powder into pieces, cut into strips, steamed and let it dry to make noodles. People often eat this dish with bean sprouts and fresh vegetables, add some slices of Xa Xiu meat and a tablespoon of lard. When enjoying this specialty, Cao Lau brings us a special feeling of sour, spicy, bitter, sweet taste of raw vegetables, flavor of sauce, and shredded fat all seem to be melting in the mouth. Banh Trang Dap ( dumpling girdle cake) are not only popular but also cheap that the locals prepare and love. Simply, this dish is a thin girdle cake covered with a thin layer of noodles with peanut oil and onion then compressed. Are you curious about the name of this cake? It is just because before eating this cake, we have to use our hands to beat on rolled cake and noodles. The part of the baked cake will break and stick to wet noodles. We will dip it into the sauce and enjoy the crunchy and glutinous taste. When you pass through the ticket office, you should pay attention to some posters on the wall, which explain the history of My Son. This will help you discover this heritage, especially if you plan to explore without a professional guide. You should watch the weather forecast to bring necessary items such as a hat, umbrella, raincoat. Do not forget to bring drinking water and wear sports shoes you feel comfortable with. You should walk only through the marked path, and do not detour into the lush forest by yourself as there is still a de-mining process going on in the area of My Son. 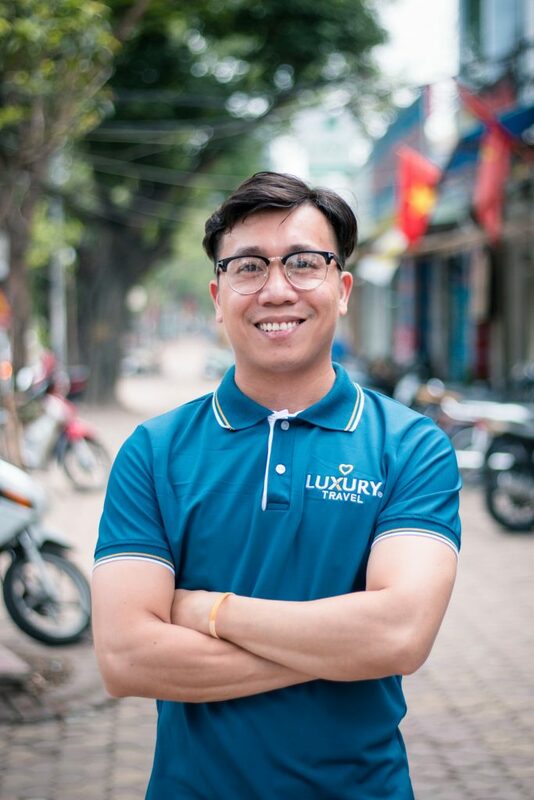 Luxury Travel Ltd. is the first luxury tour operator in Vietnam with a 15+ years of experience in the travel industry. The company has won many national and international prizes and awards for its high-end travel services. 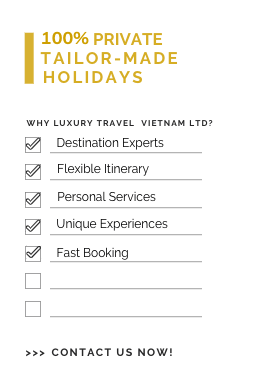 Luxury Travel Vietnam offers private holiday packages to Vietnam and other Southeast Asian countries. Consequently, Cat Ba tour by Luxury Travel Vietnam is definitely unique and stand out in the crowd. 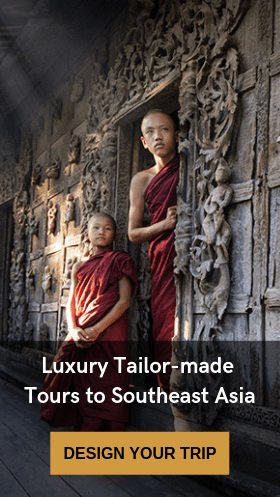 Share your interest with the travel experts of Luxury Travel Vietnam. The experienced team will clarify the information and give you an unforgettable vacation at Cat Ba National Park. So if you are planning a trip to Vietnam in general or to My Son in particular, contact us right here.